Day 3 of the challenge! Tabby cat brings home odds and ends. Today it’s a battered hat. Tomorrow a cardboard box. The next day, who knows? The weekly what-the-cat-dragged-in game has been a long-standing tradition in our household. The day Tabby brought home a pink mitten, the vigil stopped. The post-its disappeared from the bulletin board, the fridge and every other available space where they’d normally make an appearance as part of the ongoing search, trying to make sense of the nightmare. The post-its seemed to offer some sort of consolation. At least we were trying. Each little square represented a piece of the puzzle. Let me tell you about the vigil. That went in a direction I didn’t expect. That photo will always be one of my favorites, and now I will think of your haunting tale every time I look at it. That is a gorgeous photo. The sunlight looks so close to water I had to stare at it for some time to make total sense of it. I agree Alex. It’s totally captivating. Diane is a great photographer! Oh how sad, but beautifully written. 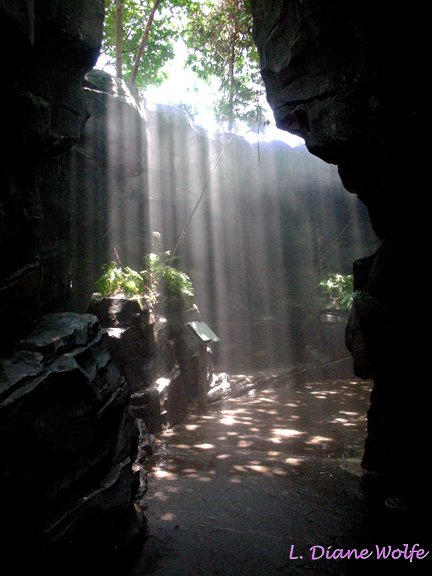 Love the cascade of light, Diane takes such great photographs. They took her away? How sad. That was a sad piece of writing. Beautifully written though. Hi Michelle – fantastic photo – I thought it was a waterfall – I wasn’t concentrating .. but how sad a tale .. haggard and dishevilled … and then they came to take her away .. desperate times – no wonder the memories are buried ..
Beautiful photo and beautiful tale. Very haunting and sad…brrr…that one will stick with me for a while! I teared up on that one, Michelle. Beautiful story and Diane’s image is perfect. Beautiful story… It’s the kind of story I want to sit with a while, beautiful and haunting. Love the idea of what the cat dragged in. Michelle, you have such a poetic way with words. Lovely picture too! Kudos to Diane. It started out as if a cute story but quickly goes into a dark, haunting place. The picture is perfect for it. Beautiful picture, sad story. Love how it evolved from the image. “Misty water-colored memories” is a line from The Way We Were, by Barbara Streisand. When last have I heard that song. That photo is amazing! Gives props to L. Diane. Cute and dark stories are my favorite. 😉 Well done, Michelle! Another commenter also said that. That is a beautiful and sad story, I really enjoyed it. You really got a haunting quality to it that was wonderful. Glad you were “haunted” but in a good way, of course. Oh my, oh my, oh my. A phenomenal photo followed by a story that will stay with me. Michelle, You always write the best stories where darkness is looming! An excellent job making this stunning image come to life! I’m so glad that my words could do justice to Diane’s photo. This pic is one of my favorites! I agree with the consensus- one of the most beautiful photos I’ve ever seen outside of a museum. And with the statement that story took an unexpected turn. It started out so light and playful and turned dark and confusing so quickly. Gorgeous photo, gorgeous writing.